justice issues, as well ​as art, makes her a versatile and inspiring speaker. She is willing to travel in Ontario and beyond. ​such as Remembrance, Earth, and Aboriginal Day. Virtual Skype Visits: $150 + HST, 60+ minutes. ​The Writers' Union subsidies are available. 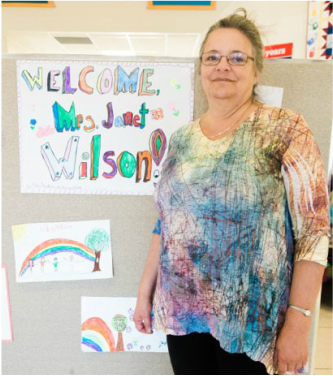 "Janet Wilson visited our school and told us that we could make a difference in the world. So, I decided to raise money for the hospital." Location: All venues, library preferred. I give age appropriate presentations to all grades. Junior and senior grades are preferred. ​150+ is considered a keynote ($550). "​Janet spoke from her heart, and that resonated with the audience. 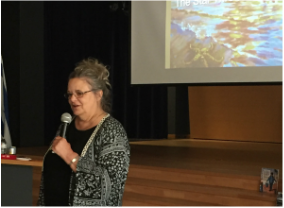 I heard repeatedly from the staff what an impact her presentation had on themselves as well as the students.. …Janet Wilson’s presentation was inspiring and active…. 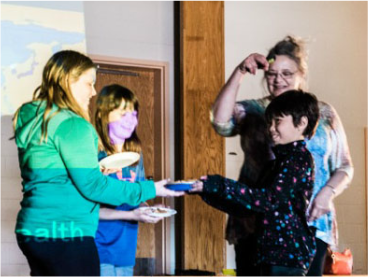 videos and pictures helped the children to be attentive and engaged…addressed culture differences, human behavior, qualities of individuals, and the history of our Aboriginal peoples…"
A glass of tap water is appreciated. A microphone if acoustics are questionable. "The students asked quality questions demonstrating a real desire to understand the issues involved." ​True heroes don’t need capes or radio-active rodent bites. They just need big hearts and the courage to take action against unfairness and injustice. Janet provides the compassionate role models who have made a difference in the world. "Just like what we’ve been talking about - being kind and helping others." ​Shannen Koostachin and her grade 8 class launched a national campaign for the right to a decent school in Attawapiskat First Nation—and won! This important true story raises awareness of contemporary FN issues such as inequality in education and services, true Aboriginal history and treaty rights, and the impact of residential schools. ​“All students in Canada deserve a learning environment that they are proud to attend and that gives them hope. We want the same hope as every other Canadian student." Eco-activists, such as 13-year-old Severn Cullis-Suzuki and her speech that ‘silenced the world’, raise awareness of issues such as climate change, and inter-generational and economic injustice. Global Peace education is the only solution to reach Peace in the world. Young activists show kids how they can be leaders, solve problems, and create a better world through ‘The power of one’ and ‘Peace begins with me’. "The students were very excited about telling me how wonderful you made them feel about being a kid!...You've inspired the students more than you know. They believe they can do anything!!" ​Basic instruction and encouragement in drawing with a portrait demonstration (the sketch is for your school); the creative process of an illustration from concept to finished art. ​ Workshops sizes are limited. "Janet’s explanation of the process she uses to create the wonderful artwork in her books was fascinating to our students." ​Janet has over twenty-five years of experience in speaking to teachers, librarians, and a variety of service organizations and faith groups on a variety of subjects.